Today was a trip back to somewhere I haven’t been since I was a child. Norwich Castle dominates the city centre on top of its huge motte, and as I was back in the area, I thought I owed it to myself to have a visit. The castle is easy to get to and find; the park and ride buses park at the base of the motte as there is now an immense shopping centre – the Castle Mall – built on and beneath the site of part of the castle bailey. Adjacent to the castle tower is a reasonably extensive range of castellated buildings containing a museum with some really interesting exhibitions. 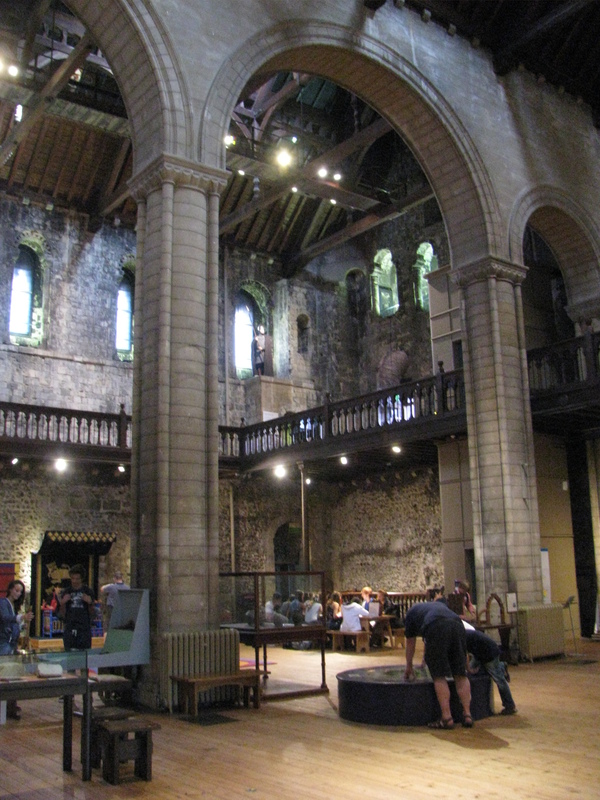 The entrance fee isn’t that bad – I paid £7.00 as a full price adult, but you have to pay extra for a scheduled tour of the dungeons or battlements, which I elected not to do. Without this you cannot access these areas. Access to the top of the motte is via a large stone bridge from what would have been the bailey, and which bridges the deep “moat”. After you pay, you go up a flight of stairs to enter the castle keep at first floor level, through the main entrance, as it should be. It’s a bit of a shame that the staircase is so soulless, just a plain stone stair in a modern passageway which is undecorated. At the top is a covered room which allows you to step back and appreciate the carved masonry of the arched entranceway, which is nice to see. Stepping through the gateway into the keep, you are on a timber balcony which extends the perimeter of the keep, and permits access to the small rooms within the width of the walls, such as the garderobes (toilets) as well as the stair down to the ground floor. It is clear from this level that a mural corridor, or sequence of narrow rooms, runs around the second floor level, but this is not accessible unless it is part of the battlements tour. In one corner of the keep is the private chapel of the castle, with somewhat eroded carving. Looking up towards the ceiling you can see some fairly spectacular woodwork, but this is not original. In the centre of the castle are three great archways which rise to support the roof structure. These are not original features, but were built to support the new roof when it was built. Descending to the ground floor, there are a number of interesting and interactive displays, including a cutaway model of the keep, and models to help explain methods of construction, as well as the covered well. Stairs lead down to the basement, which contains an exhibition about the castle’s use as a prison through the ages. A further doorway leads out into the museum section of the property. Despite the external appearance, the castle keep is built of flint, and only faced with fine stone. Although it looks somewhat strange, the cladding and arcading of the castle was faithfully carried out in accordance with the original design when it was all redone. This is a very elaborate and decorative feature of the castle, not at all in keeping with the perception of a Norman motte and bailey castle or grim keep. There are two very important things to consider which explain this. The first is that the original stone used was Caen stone, the best that the Normans could find, and used in places like Jumieges Abbey. It was expensive, difficult to bring to Norwich from Normandy, and its use was clearly intended for display. The second is that the keep at Norwich Castle was not purely military. In several places, it is referred to as a palace. It was held for the King himself. So the decoration was intended to beautify the royal palace of the Norman Kings of England, and show off their wealth and power. 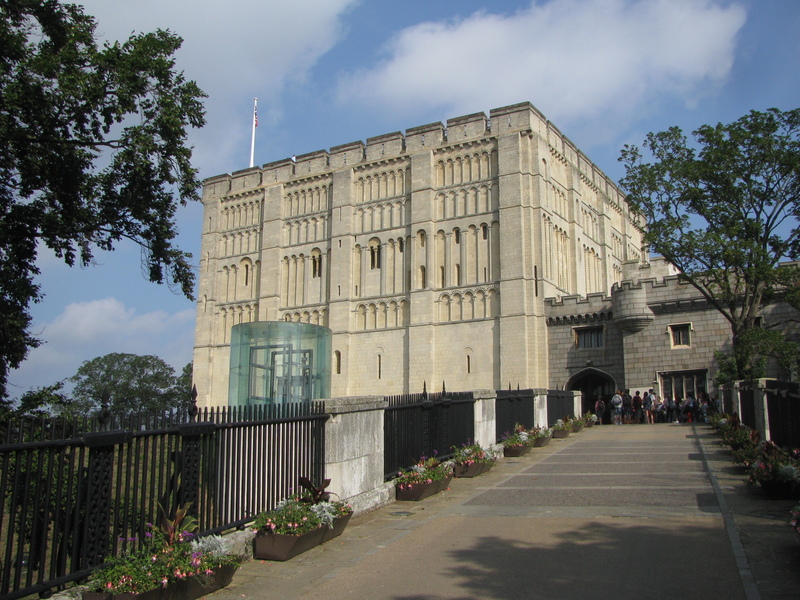 At the time of the Norman Conquest, Norwich was one of the largest cities in England. Norfolk was the most populous county, and East Anglia, the Earldom of which it was a part, had been held by Harold Godwinson for many years before he became Earl of Wessex, at which point one of his brothers held it. Shortly after the Conquest, the rebellion of Hereward the Wake covered the Fens and west Norfolk. A few years afterwards, the Earl of Norfolk, Ralph de Gael who held the castle here, was involved in the Earls rebellion against William the Conqueror, and was exiled. The upgrading of the motte and bailey castle to a full-scale Norman castle complex and palace was not just a statement about wealth and power, but a notice to the people of Norfolk – the Norman Kings were here to stay. The museum areas provide several displays I found interesting, one on the Romans and the Iceni revolt of Boudicea, one on Saxons and Vikings, but the one that stands out in my mind is the same one that I had an image of in my memory from thirty-odd years ago. That is an extensive collection of taxidermy, mainly of the wildlife of Britain, but also some lions and a tiger. I always find such exhibitions rather eerie, and don’t enjoy them. As an adult, walking around, I was struck by a curious and rather sobering thought – is this the way future generations will see wildlife, stuffed and in a glass case in a museum display? Surely it deserves better than that! The museum is provided with a shop and a cafe, but after the taxidermy I wasn’t feeling hungry, and I didn’t spend enough time in the shop to be able to pass comment, although it was quite extensive. Going outside, I walked around the outside of the motte, which enabled me to have a closer look at that decorative arcading and see the “back door” of the keep, but apart from some good views of the city, there wasn’t that much to see. The keep occupies about a quarter of the summit of the huge motte, so there must have been additional buildings and potentially a perimeter wall around the summit, but these are no longer in existence, and the museum buildings are modern. 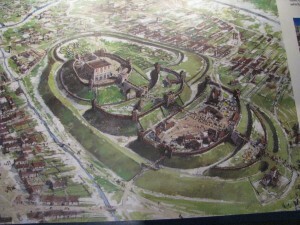 The nearest bailey section – partly on top of the mall, I am guessing – does have a garden with benches which gives some nice views of the castle, and at a stretch can be envisaged as a bailey, but it isn’t possible to visualise the full scale of the Norman earthworks as shown in the model and reconstruction of the castle at its height. I really enjoyed visiting Norwich Castle again. For me personally, though, I just wish there was a bit more history of the castle, and a bit less stuffed animals!